Kittiwake Boats pride themselves on providing original, hand-built quality craft. Their traditional lines belie a clever and wholly appropriate matching of modern and traditional materials. Gaff rigged for authenticity - boats from this workshop are already taking their place at traditional rallies throughout Europe. The Kittiwake range of dayboats are made from composite materials, having a GRP/Fibreglass clinker hull but with a lovely hardwood fit out. 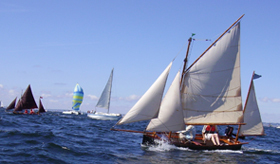 The traditional sailplan is gaff rigged, and with a mizzen and two headsails is known as a Gaff yawl cutter, (Falmouth quay punt). These boats ranging from 14ft/4.5mtrs to 16ft/5.3mtrs are performance centreboard sailboats, with good speed and manoeverability, as well as being stable, fully recoverable and very safe. They can also be rowed, and motored by outboard engine. They are trailersailers,easily rigged and sailed singlehandedly, sleep on board or just daysail,and keep at home, versality is the name of the game. 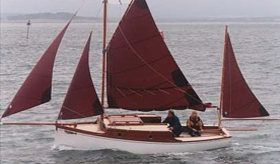 The Kittiwake 14 Classic is designed to give the appearance of a wooden boat, using a simulated clinker hull in GRP and plenty of lovely timber inside so as to hide as much of the GRP as possible. An ideal camping dayboat, with the performance of an old fashioned racer. Nice and sturdy, very stable and yet fast and manoeuvrable. The Kittiwake 16 nicely fills the gap between the 14 and the 20. 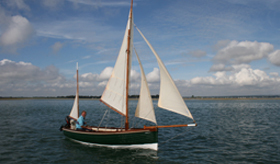 Based on the traditional "Falmouth Quay Punt" lines, the GRP Kittiwake 20 has been brought up to date by making her more full bodied in the mid section and the cockpit.